Bogart is the winner of two Obie Awards for Best Director for No Plays No Poetry But Philosophical Reflections Practical Instruction Provocative Opinions and Pointers from a Noted Critic and Playwright (1988) and The Baltimore Waltz (1990), and the Bessie Award for Choreographer/Creator for South Pacific (1984). She was a 2000-2001 Guggenheim Fellow, and won a National Endowment for the Arts Artistic Associate Grant in 1986-87. 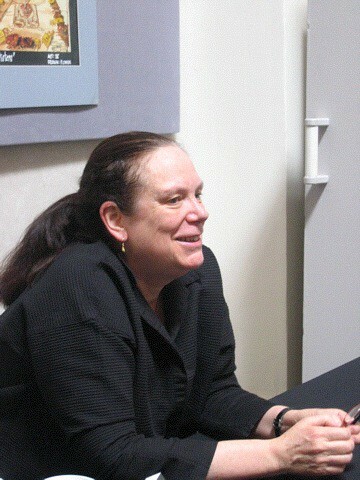 In 1992, she co-founded the Saratoga Theatre Institute (SITI), where she currently serves as Artistic Director. She also heads the Graduate Directing Program at Columbia University. She has written several works on the theater, including, “Anne Bogart: Viewpoints,” “A Director Prepares,” and “And Then, You Act.” Today, she and Tina Landau’s “Viewpoints” method is one of the most consistently studied in the country. In-between teaching and premieres and a plethora of other projects, including imminent plans to cut off her signature ponytail for “Locks of Love,” Ms. Bogart found the time to answer questions about the path she forged to get where she wanted to go. When did you make the decision to pursue a career in the theatre? A.B: I took a year off between graduating from Bard College in 1974 and entering New York University in Performance Studies. Actually, the program at NYU was not called Performance Studies in those days, rather something like Theater History and Criticism. While at Bard I joined a theater company called Via Theater, formed to explore the work of the then groundbreaking Polish theater director Jerzy Grotowski. The physical and vocal demands in the company were grueling, but rewarding simultaneously. After college we were invited to Delhi, India to work with a theater there. We never made it to India. As a matter of fact, to this day I have never been to India. We made it as far as Greece and Israel before we had to give up and head home due to an unforeseen injury of one of our group. This marked the end of Via Theater. My theater professor at Bard, Roberta Sklar, told me before I graduated that I should move to New York City, find a writer and form a company. I decided that I wanted to give this idea a try and so I moved to Manhattan. But being a theater director was something that I chose long before then. My path was decided after my first directing experience at Middletown High School in Middletown, Rhode Island: Eugene Ionesco’s “The Bald Soprano.” I had just turned 16 years old and that experience did it for me. I was hooked. I never wanted to act or design. I always knew that directing was for me. Was there ever a time when you wanted to give up? What made you keep going? I want to give up often. To this day when things are not going well in rehearsal I feel that I should be fired and a real genuine professional theater director should be hired in my place. I imagine that everyone involved is wishing for someone with a more definite sense of direction. This feels lousy. It‘s hard to pin down what keeps me coming back to the plate. Perhaps it is ego or will and ego or stubbornness that keeps me sticking with the project through exhaustion, butting up against challenges until I break through and then coming back for more. But then suddenly the fresh excitement about a new project or brand new challenges give me hope and the requisite enthusiasm to move forward and take on the next idea. As someone who has worked, and still works, largely in an avant-garde arena, was it difficult to become recognized and to make enough money to support yourself? I guess it is difficult for anyone to break through or gain recognition. I am sure that we all want to be recognized, to be seen and to be appreciated. I know that I do want to be visible in the world. And perhaps it is again my stubbornness that keeps me going. The image that I have is all about my feet. I imagine looking down at my feet each and every day walking to rehearsal. It is the walking, the getting there, on time, that seems to be the key. Keep moving. Get there on time. This seems to help. Money is always an issue. There is never enough money. But I do not mind that one has to look carefully at one’s particular circumstances and advantages and then make smart decisions that use what is available and work in a way that is financially sustainable. Before you were able to support yourself wholly on the theatre, what kinds of jobs did you have? I was a night cook in a seafood restaurant, an expense analyst in a Wall Street brokerage firm, I taught theater in an after school program for the United Nations School, I ran workshops in a halfway house for the mentally unstable and I hot-walked race horses at a race track. In my mid-twenties I was lucky to be hired by NYU to teach in the Experimental Theater Wing. This meant that I could earn money doing what I loved. I did not know what or how to teach so I just directed plays with the undergraduate actors. The salary from NYU would pay for my base necessities and the rest I would spend on my own productions in the downtown theater arena. During the time before your career picked up, where did you live? My first home in New York City was a loft on Grand Street between Broadway and Crosby Street with three bedrooms, a living room, a dining room, kitchen and a dance studio. It cost $325 per month and each of us paid a little over $100 per month. There was no heat. Next I lived in a loft on Walker Street that cost $450 per month split by three of us. Then I lived in a brownstone in a then very iffy neighborhood in Brooklyn that cost $325 per month. Three floors. I shared the rent with my best friend David Schechter. Then for ten years I had a tiny apartment on the fifth floor of a five-story walk-up on First Avenue between 3rd and 4th Street. This was essentially the 1980s. It cost $165 per month when I moved in and $235 per month ten years later when I moved out. The less expensive New York rents in those days made it possible to pursue a life in the theater. Do you remember what would be on a grocery list from that time? Coffee, yogurt, cereal, apples, cheese, cleaning goods. What did you spend your money on then, and what do you spend it on now? That has not changed at all: books and music. Were a lot of your early ideas resisted at first? When I was younger there was definitely resistance to my work and it was palpable and challenging. There is still resistance to my work. I think that I have made a perfectly good career from consistently bad reviews. And then the reviewers are always asking why I am not doing the kind of work that I was doing five years ago. Well, I want to remind them that they did not like it then. Did you ever find that you faced particular challenges as a woman in your field? Male directors certainly have an easier career path than women directors. Women directors have to work twice as hard and have to be far wilier than the guys to get on with it. Often we have to go around and enter through the back door in order to get to the front. We have to go away and then return with a body of work. Do you think of your work differently now that you know it will be seen and respected as opposed to when you were struggling to find an audience? I am still just as nervous before each and every rehearsal as I was as a young director. If anything, the stakes feel higher. My stomach gets upset and I won’t go into the physical details manifest by my nervousness. How do you see your director and teacher roles in interplay? One of my students at Columbia whose father is a surgeon said that surgeons have a saying: “1/3 study, 1/3 do, 1/3 teach”. When I heard this I knew that this is exactly right for me too. I need to spend one third of my time studying, one third directing, and one third teaching. If I get unbalanced in any of the three, for example if I am directing too much without enough time to study or if I am teaching too much without enough time to direct, I suffer from this imbalance. Teaching gives me the opportunity to develop ideas that I have been studying and directing gives me the opportunity to put these developed ideas into practice. What advice would you offer young people just starting out? Be courageous. Do not wait for the right circumstances to make your best work. Make your best work with the circumstances you are in right now. Make new work constantly and then, perhaps most importantly, put it in front of an audience. Then learn from that experience with an audience and then make the next thing. This entry was posted in Directors and tagged "No Plays No Poetry But Philosophical Reflections Practical Instruction Provocative Opinions and Pointers from a Noted Critic and Playwright", "South Pacific", "The Baltimore Waltz", “A Director Prepares”, “And Then You Act”, “Anne Bogart: Viewpoints”, Actors Theatre of Louisville, Anne Bogart, Bessie Award for Choreographer/Creator, Graduate Directing Program at Columbia University, Guggenheim Fellowship, Jon Jory, National Endowment for the Arts Artistic Associate Grant, Obie Award, Saratoga Theatre Institute, SITI, Tina Landau. Bookmark the permalink. I am trying to cite this interview in a research assignment for a directing class. What year was this published in? This interview was published in July, 2010.